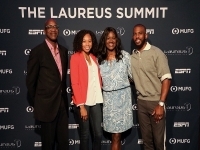 USPA NEWS - More than Two Dozen Athletes and Leaders spoke at the 19th July's Laureus Summit presented by ESPN at LA Live in Los Angeles, which aimed to shine a Light on Sports Positive Impact on Youth and Communities across the Globe. Falling on the 100th Birthday of Laureus Founding Patron Nelson Mandela, the Summit also celebrated his Legacy and propelled his Belief that "Sport has the Power the Change the World." More than Two Dozen Athletes and Leaders spoke at the 19th July's Laureus Summit presented by ESPN at LA Live in Los Angeles, which aimed to shine a Light on Sports Positive Impact on Youth and Communities across the Globe. Falling on the 100th Birthday of Laureus Founding Patron Nelson Mandela, the Summit also celebrated his Legacy and propelled his Belief that "Sport has the Power the Change the World." The Day kicked off with a Warm welcome from NBA All-Star and Laureus Ambassador Chris Paul, Olympic Legend and Laureus USA Chairman Edwin Moses and Olympic Gold Medalist and Laureus USA CEO Benita Fitzgerald Mosley, followed by a Panel Discussion which included Olympic Gold Medalist Allyson Felix. ESPN Analyst/espnW Contributor Julie Foudy led a Panel on "Athlete Activism" with Olympic Fencer Ibtihaj Muhammad, WNBA's Nneka Ogwumike, Special Olympics Athlete and Manager Dustin Plunkett, and Olympic Legend and Humanitarian John Carlos. To close the Event, All Blacks Rugby Legend Sean Fitzpatrick joined South African Rugby Legend and Laureus Ambassador Bryan Habana to speak about the famous 1995 Rugby World Cup in South Africa and Nelson Mandela's Legacy with an On-Screen Welcome from Kweku Mandela, Nelson Mandela's grandson. 2018 Olympic Gold Medalist and USA Women's Hockey Captain, Meghan Duggan, also spoke as part of a Session on "Putting Women in the Lead." Laureus USA also announced the Results of its Annual State of Sport for Good Report which revealed that Sport can play a Significant Role in reducing Discrimination among Children and Youth in the United States. The Report, which surveyed 546 Sport for Development Organizations collectively serving more than 800,000 Youth, found that these Programs are effectively improving their Communities, and that Sport has the Ability to reduce Discrimination among Youth. Sport for Good LA, which Laureus USA plans to launch in 2019, was announced at the Summit with a Panel moderated by Anne-Marie Jones, VP of Grants & Programs, LA84 Foundation and including Allyson Felix, Olympic Gold Medalist ; Tony LoRe, Youth Mentoring Connection ; Nichol Whiteman, Dodgers Foundation. Sport for Good LA, which provides Grants to Non-Profit Organizations that use Sport to improve the Lives of Youth, will mark the Fifth Sport for Good City as part of the #20x20 Campaign, with a Goal of bringing Sport for Good Cities Program to 20 Cities by the year 2020. Presented by ESPN, the Laureus Summit coincided with the Sports Humanitarian Awards on July 17 which honored Athletes, Teams, Nonprofits and Corporations for using Sport to make a Positive Impact on Society. Laureus USA also welcomed their new Global Partner, MUFG, who provided Sponsorship of the Summit. Additional Sponsors included Weingart Foundation, Parsons Foundation, Los Angeles Sparks, LA84 Foundation and hClub LA. * Spotlight on Sport for Development Projects Around the World featuring Dima Alardah, Jordan, U.S. Department of State Global Sports Mentoring Program Delegate; Cynthia Coredo, Boxgirls Kenya, U.S. Department of State Global Sports Mentoring Program Delegate; Vivian Puerta, Executive Director, Foundation Colombianitos; and Mark Clark, CEO Generations for Peace from the Middle East. * The Power of Collaboration :Fostering Collective Impact in Communities featuring Tamika Curry Smith, MBUSA ; Sky Hyacinthe, ELEVATE New Orleans, Charlene Burgeson, Active Schools, and Jill Vialet CEO & Founder of Playworks. * The Rise of Athlete Activism moderated by ESPN analyst/espnW contributor Julie Foudy with panelists Ibtihaj Muhammad, Olympian Fencer and First Muslim Woman to win an Olympic medal for the United States ; John Carlos, Olympian and Activist ; Nneka Ogwumike, Los Angeles Sparks Player and President of the Women's National Basketball Players Association (WNBPA); and Dustin Plunkett, Special Olympics Athlete and Manager. * Putting Woman in the Lead : Spotlighting the Importance of Female Participation and Leadership in Sport with Asani Swann, VP Melo Enterprises ; Caitlin Morris, GM Nike Global Community Impact ; and Geraldine Bernardo, Philippines, U.S. Department of State Global Sports Mentoring Program Delegate, and Meghan Duggan, Captain of the US Women's Hockey Team. * The Invictus Story : The 1995 Rugby World Cup in South Africa and Nelson Mandela's Legacy with Bryan Habana, Laureus Ambassador and South African Rugby Legend ; and Sean Fitzpatrick, Laureus Academy Chairman and Captain of the All Blacks in 1995. 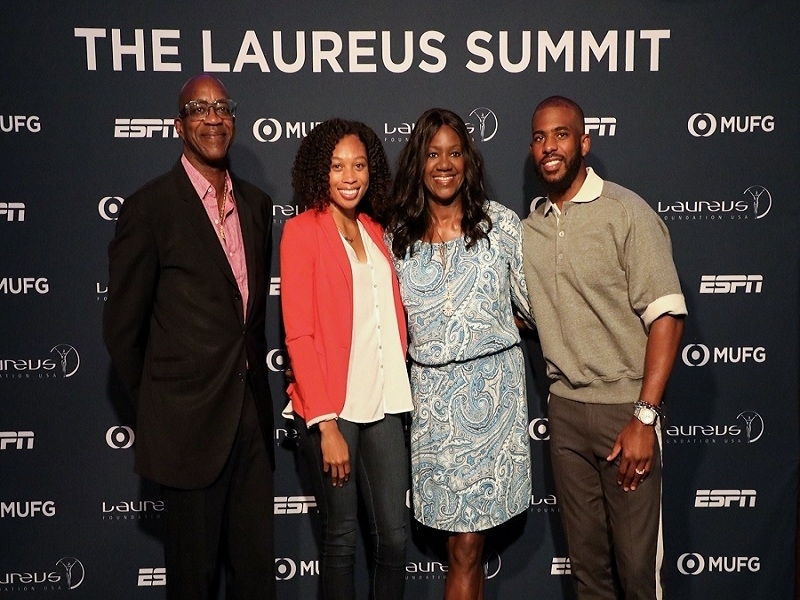 ** Photo Cover : Olympic legend and Laureus USA Chairman Edwin Moses, Olympic Gold Medalist Allyson Felix, Olympic Gold Medalist and Laureus USA CEO Benita Fitzgerald Mosley and NBA All-Star and Laureus Ambassador Chris Paul at The Laureus Summit.